The other day I came home to a package that had a big bottle of KC Masterpiece® Buffalo Marinade in it—-courtesy of the Foodbuzz Tastemakers Program. I immediately thought of whipping up a batch of Buffalo Wings….because who doesn’t love a good Buffalo Wing? But at second thought, I decided to try something different and take a spin off of another great pub food—Fried Calamari! 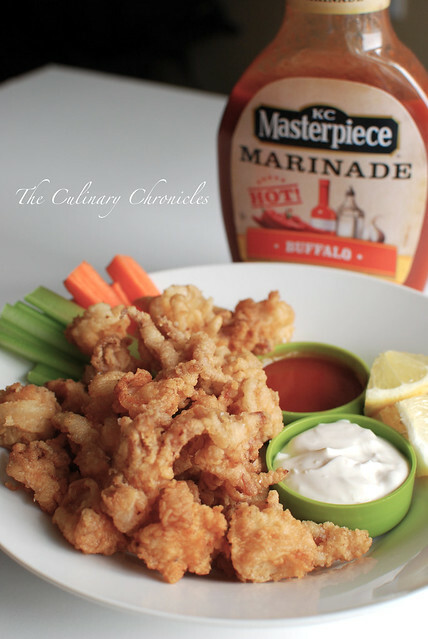 I attempted to mimic the Buffalo Wing taste by marinating the calamari in buttermilk and KC Masterpiece® Buffalo Marinade. 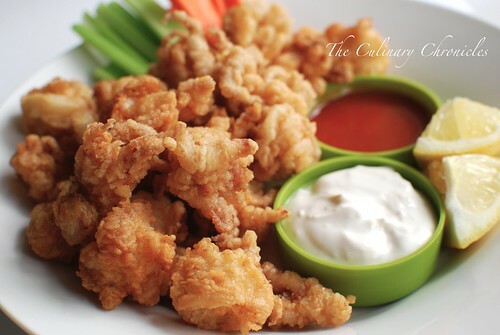 After a quick toss in flour and a few minutes of deep frying, I had a plate full of crispy–yet tender, Fried Calamari. I’m not sure I fully tasted the flavors of the marinade in the Calamari by itself. But after a little squeeze of lemon and quick dunk into the Buffalo Marinade, the flavors were definitely more prominent. In a large bowl, mix the marinade and buttermilk together. Add the cleaned calamari—ensuring it’s well covered in the liquid. Cover the bowl with plastic wrap and place in the refrigerator for at least 45 minutes. Place a large colander in the sink and pour the calamari with buttermilk mixture into it. Gently shake the colander to drain off the marinade. Use paper towels to blot off excess liquids. In a large pot (or deep fryer), preheat oil to 375 degrees. In a large zip lock bag, add the flour, salt, and pepper. Add the calamari zip the bag closed. Shake well to evenly coat the calamari. Pour the contents of the bag into a large sifter (or you can do this in batches) and sift the calamari to get rid of any extra flour. In batches, carefully add the calamari into the hot oil and cook for about 3-4 minutes or until lightly golden and crispy. 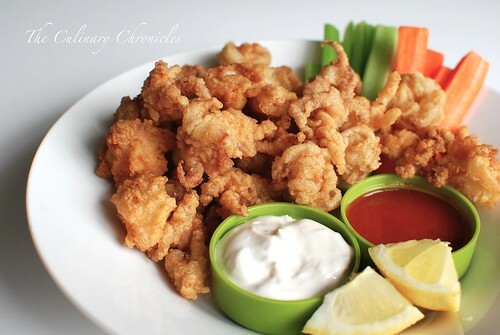 Transfer the fried calamari to a paper towel lined plate and sprinkle with additional salt. Repeat until all the calamari has been fried. I tried making fried calamari once and totally failed. So jealous! Your calamari looks so good! Great pictures! I haven’t tried any KC Masterpiece Marinades yet, but I think I need to add the buffalo flavor to my shopping list. BLEH!! WHAT A TEASE. : P i just reread your post and saw that it is KC, not KFC! boohoo…going to cry now. Hmmm! Perfect Friday recipe. Just feel like celebrating (for the weekend) and fried + baffalo flavored calamari just sounds perfect to me! The color of calamari is just right. Oh looks so delicious Nam! I always need to remember to add buttermilk. MUST, right? Great post! Just wanted to say Congrats on Top 9!!! Whoohoo! Yum it looks delicious. I have to admit that I’m a big wimp and have never tried at home deep-frying. I’m too scared but calamari is on my list when I finally get the courage. This does sound so tempting and delicious! Amazing presentation as always! Ohh almost forgot, got lost in my own words..Congrats on top 9!!!!! Enjoy your Sunday! Fantastic idea! These look delicious. I will def have try–if I can find fresh calamari here. ??? I’ll have to check that out. This looks amazing– I am definitely going to give this a shot! I love this idea, how delicious! I’m pinning this to try. Thanks, Nam! THANK YOU for your sweet comment 🙂 Isn’t the food blogging world an unexpectedly wonderful community? I will def swing by your site and Happy Foodventures!